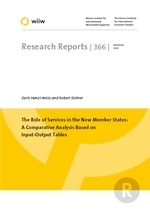 Using input-output analysis, this research project investigates the role of services in the Central European new EU member states (NMS) – the Czech Republic, Hungary, Poland, the Slovak Republic and Slovenia – and compares it to that in Austria. The role of services includes not only their position in the production structure per se but also their increasing importance as an intermediate input for manufacturing and other services. As services were underdeveloped under the former system in the new EU member states, it is interesting to look at their features and changes over time. The analysis is based on Eurostat supply and use tables and done at the 2-digit level (NACE rev. 1/CPA) for the years 1995, 2000 and 2005 (in nominal values only). For certain parts of the project symmetric industry-by-industry input-output tables were constructed. The main findings are the following: a strong focus on manufacturing output, value added and intermediates still prevails on average in the NMS, while services are underrepresented. Between 1995 and 2005, structural change towards services took place in the NMS both on the production and use side. However, major structural differences still exist in comparison to Austria, which shows higher dynamics than the NMS and turns out to be a moving target. In a key sector analysis, service industries were classified as ‘key’ industries, depicting strong forward and backward linkages. Over time, especially backward linkages have grown. The expected ‘gap’ of knowledge-intensive business services vis-à-vis Austria at the beginning of the period was not revealed by the data for the Czech Republic, Hungary and Slovenia. Until 2005, Austria showed a pronounced shift towards ‘other business services’ and overtook the NMS in some respects.